Beach Front Condo~So Close To The Water You Can Feel It~SPECIAL..December 4-13! 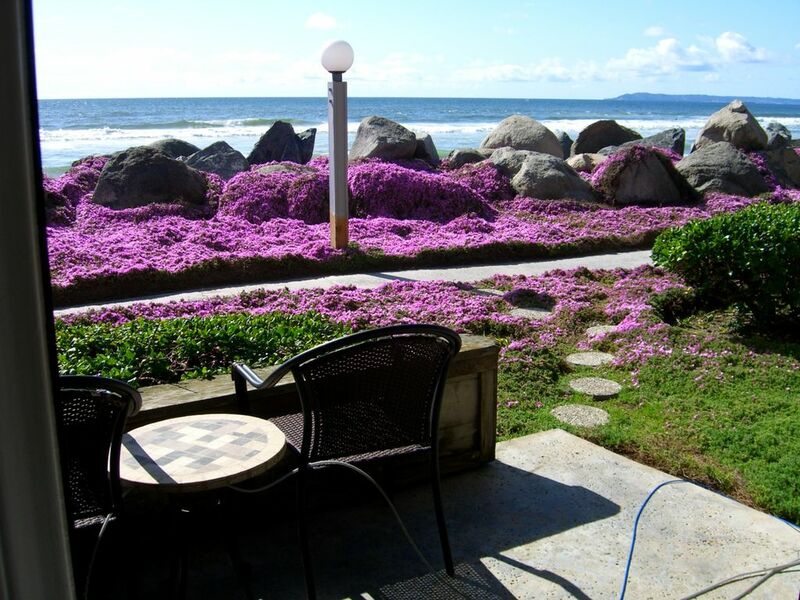 BEST KEPT SECRET~ STEPS TO THE BEACH ~ Beach Front Condo... SPECIAL.. June 16-20.!! So Close To The Water You Can Feel It ..Nothing Between You and the Ocean ~Were On The Water~Come Visit Out Newly Remodeled Beach Front Condo..!! !Fill In The Gap Specials..!! Majestic views from every room except the extra bedroom which has a view of the wildlife estuary. When the tide comes in the estuary fills up with water so you surrounded with water on both sides. There is "Nothing between you and the ocean" A magnificent beach front rental accommodation with spectacular views of the Pacific Ocean from every room... this vacation rental is a “bottom corner unit “ and very unique if you want to be close to the water..!! It’s very accessible from the time you park, with 4 little steps to the front door. Every room has an ocean view except the guest bedroom which has an awesome view of the wildlife estuary..!! This vacation rental rests in a lushly landscaped, un-congested setting on the southland shore. The nicely furnished condo has an awesome view of the water, surfers and the breathtaking skyline of the islands of Coronado. You can even catch a glimpse of passing dolphins playing in the surf. Rent horses for a stimulating canter along the shore! Walk to the pier for sport fishing, and visit Sea World and the San Diego Zoo! Relax on two private patios from the master bedroom and living room which walks right down to the beach. Even though we don't have a swimming pool (our front yard is all ocean) you'll have access to a large municipal pool facility with two swimming pools (one for laps and one for children to play). It includes a full fitness center on the beach equip with a basketball center and rock climbing gym. There is great biking trails, and road cycling with paths, Great golfing nearby, Volley ball and Tennis courts, horseback riding on the beach ...my favorite ride is on the full moon..!! Come enjoy the fine restaurants, unique shops, and exiting night life of San Diego! During high season through July and Mid August, rentals will be Saturday-Saturday!! It was a dream come true when I walked in the door and almost fainted and jumped for joy at the same time ..right then I knew we had to have this little slice of heaven. :-)) This lovely couple could felt our vibration and gave us a chance of a life time by accepting our offer and not taking the others, which were economically more..!! Her words exactly: You two reminded me of my husband and I as Newley weds, and we wanted to give you a chance of a life time, to be as happy as we were..!! It breaks my heart to this day , I still get teary eyed, how fortunate we were to have this piece of heaven..which we put our hearts and soul into maintaining for others to enjoy and experience their little piece of heaven..:-)) Yes, this picture was taken a few miles away in the wild flower meadow by the equestrian park..where you can ride horses on the beach..!! When I bought my property in 89 as soon as I walked in the door I knew this was the place for me ..so close to the ocean and every room a magnificent view..!! There is nothing between you and the Ocean ..You are so close , while sitting or sleeping the sound of the waves are to die for while falling asleep..!! If you throw a rock it would either hit the sand or the water depending on the tide..!! Seeing is believing..!! It's like you own private beach, and when you have your friends or kids with all their toys, surf boards , or boogie boards , you can leave them right on the patio, for your conveyance, and then rinse off in the out door shower, which is right next to the corner patio..!! There is something for everyone from hiking in the wildlife sanctuary, or an awesome Spa 5 min away, an amazing 50 meter pool right on the Ocean, with a fitness center, 5 min away, Great Equestrian stables to ride horses on the beach, wonderful restraints, plays , theaters, farmers market, movies in the park, even a drive- in movie theater kids love , 5 min away, amazing sunsets , surfing , kite surfing, boogie boarding, deep sea fishing, Kayaking, paddle boarding, biking , it's all within a few minutes from you..!! My favorite ... is biking to Coronado and taking the Ferry across to downtown SD Gas lamp area, for dinner, lunch, shopping or brunch , a taste of the night life SD has to offer, ..!! Also running / walking the 10 mile stretch to Coronado, with my dog, having dinner a play, catching a ride with Uber back and kicking it by the fire to the sound of the Ocean while falling asleep:-)) Love to share this little piece of heaven with you..!! My unit is steps to the beach... can't get any closer to the ocean or you'll be in it..!! Every room as an Ocean View except the from the guest bedroom,that overlooks the Wildlife Estuary which is a Bird Sanctuary..!! Nothing between you and the Ocean ..you can't get any closer to the water or you'll be in the water..!! All those amenities are within walking distance or 5-10 minutes away, except the golf which is between 15 -20 min..!! There are surfing, kite lessons, windsurfing, deep sea fishing you can sign up for, and the Coronado Community Pool rated the best in the country, directly on the Ocean with 3 pools, and a kids pool, 50 , and 25 meter pools, and diving area and they have swim lessons...!! You can rent any water sports you would like right down the beach from us..!! Location is excellent- beach is literally right off back patio. Home is comfortable and relaxing. Stunning views out the sliding doors overlook the ocean. Loved this area- quiet and we felt like we had the whole beach to ourselves, yet close enough to walk to the pier and other attractions or just a short drive from San Diego. What I LOVED: LOTS of fresh towels available. Many vrbo's I've stayed in have barely had enough for a stay, so this was a lovely surprise! The LOCATION. Being able to walk straight out onto the beach was lovely, the view amazing, even seeing whales and dolphins out in the water one morning. A lovely walking distance to the pier. NOT SO GREAT was that the livingroom doors still do not open, and this has been ongoing since at least October, as I read in another review. One of the couches was covered with a dirty sheet, so we just avoided that one. Communication with the owner was difficult to make happen, and once it did, it remained difficult in that she talked over me and raised her voice, as mentioned in another review as well. Her cleaning crew was late so we were unable to bring our groceries into the condo until over an hour past check in time. We set our groceries on the front step and walked the beach while we waited. During this time the owner called me and told me I needed to immediately go back to the condo to communicate with her cleaning crew for her, which I found very unprofessional. This was because although I felt the owner had given me permission to drop our bags at the condo early, the owner denied that she gave this permission unless the cleaning crew was present. I did not get that message when we spoke. When she called to give directions to get into the condo and the rules of staying there, she talked extremely fast, and I had to rapidly write 2pagesofinfo down. This info could be typed& emailedOn the last day of our stay, we left the condo one hour before checkout time to go walk for one last coffee. I forgot my phone so I went to go back in, and we were locked out. The combo to get into the condo had already expired! So watch out for that! Thank heavens I had accidentally left the bedroom sliding door unblocked, or we wouldn't have been able to get back in! Many windows in the condo didn't open, and it would get stuffy at times. Fan in the master bathroom broken, and even the toilet paper roll holder was held together by electrical tape. These little things wouldn't matter so much if the owner had not spoken harshly to me on the phone. I didn't feel that I would want to contact her even if I needed to after being treated like an employee by her. The cleaning crew should have been contacted ahead of time by the owner so they knew we would be dropping our bags off early. We did not have a car to store them in until checkin time. I'm deeply sorry you felt my communication with you was so abrupt. First of all you were walking on the beach with the wind and sounds of the ocean, I could barley hear you!! When I spoke you asked me to speak up. You asked my permission to access the condo before check in at 3 pm. I specifically said when you arrive to ask the cleaning ladies if it would be alright to leave your luggage and groceries in the unit while their cleaning. Instead you put them in the unit without checking with them. You took Uber and had nowhere else to leave your things, which would delay their cleaning time with those obstacles, your luggage, groceries, and can be very confusing when they see luggage, groceries, it looks like tenants are staying, which is why I wanted you to return as soon as possible to let them know before they were to leave, not knowing it was yours!! You also know the Patio sliding glass door off the master bedroom works fine, and the one off the living room does not open, and has been on back oder for months since its retro fit, and had to change companies. Were very anxious to have( 2) Simonton retrofit sliding glass doors with white vinyl frames, coastal package with tempered Low-E glass and argon and finished on the interior with primed door casing.. Installed April 18, 2019. You mentioned the windows would not open, and the light in the master bedroom bathroom was out. There are 2 light in the master bedroom and the heat lamp was out and they did not have the style we needed. All the window's work great. The cleaning ladies put a clean sheet over the new couches, since they thought you were bringing your pets and wanted to protect the couches. The locks are keyless entry and as long as you have the code you'll never get locked out, which is what we love and so easy, never have to worry about loosing keys etc. I take huge pride in my unit and will continue to work very hard in maintaining my unit. When there is an unforeseen circumstance, or a special request I always try and accommodate. I can always be reachable by phone or text. My family and I enjoyed staying at this location. It was very quiet and peaceful. The condo was clean and inviting. Comfortable beds and adequate space. The only thing that was inconvenient was the fact that the patio door off of the living area did not work. We would have enjoyed relaxing in that room with an open door. A screen door on the bedroom would have been nice as well. Kayli was a perfect host and I look forward to staying at her place in the future. We enjoyed the view and watching the ships moving around. The condo was clean. The housekeepers do a great job. The sliding glass door in the living room was broken and could not be used to go out to the beach. We had to use the sliding glass door in the bedroom (lock broken on that door) or the front door and go around to get to the beach. Owner did say she was fixing the living room door. Communication was limited with owner until we contacted Home Away. She then contacted us. We received information we needed to assess the condo. We enjoyed our time in the area. Fun beach!! We couldn't of been happier with this rental. We came to Imperial Beach to visit relatives, and discovered a hidden gem. The beach was literally steps away and the pier was a short walk away, as well as gift shops, cafe's and restaurants. The views of the ocean were stunning, right from the living room, and we fell asleep to the sounds of the ocean every night. We really had no problems, and Kayli was responsive, even to answer simple questions. We were looking for quiet, safe, comfortable, clean and with amazing views - and that is exactly what we got. Everything went smooth from booking - to speaking with owner about details - to finding - to enjoying our days. Kayli, the owner, was delightful and shared everything we needed to know. She accommodated our needs to make our stay rewarding to fit with our times and variables due to traveling with my elderly mother. I got to run on the beach at sunset, hubby got to finally enjoy time off work and do some chillaxin', mom got to see the ocean and collect sea shells. Special note: everything you need is there and available-from kitchenware to fireplace and all in between. Just pack your toothbrush and beach clothes and your good! I was hoping you had a chance to relax and get a run or two in while enjoying special time's and great memories with your mom..!! She's lucky to have an awesome daughter who is there for her every step of the way. My prayers are with you while cherishing as much precious time with your mom, and our place will always be here for you and the rest of your family!! Bird watching sanctuary where you can ride your bike and see the awesome wild life, deep sea fishing, all water sports, festivals , farmer's market, great shopping , restaurants and much more.! !